A few years ago, I started my social media management business while working 40 hours per week at my full-time job. I wanted to work for myself on my own terms and I wanted the freedom and flexibility to work on projects I enjoyed. But the thought of outright quitting my corporate job scared me so I decided to start my social media consulting work on the evenings and weekends that I was off from work. It got to the point where I was able to make $3,500 per month in extra income while only working 2 hours per week. This extra money allowed me to pay off my students loans and also my car note so that when I was ready to quit my job, I was debt free. See, when you are debt free it’s easier to start a business because you’ll have lower monthly expenses. I also was able to save an emergency fund of a couple of months so that I had a cushion in case I had some slow months in my business. This allowed me to feel more confident about quitting because I had a steady stream of income plus a savings and low expenses. 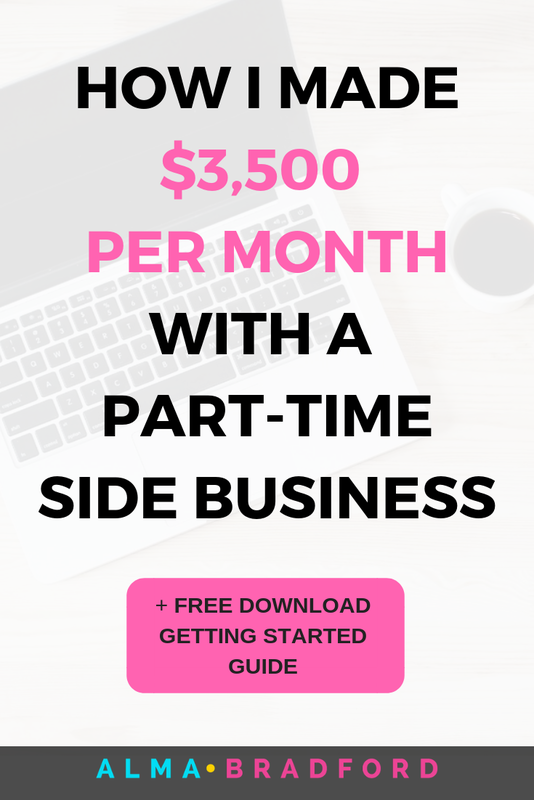 By now you must be curious and want to know how I could work full-time and bring in that side income. In this article I am going to explain exactly how I did it. I started a social media and blogging business where I helped small business owners post on Facebook, Twitter, Linkedin, Instagram and even Youtube. I used online freelancer platforms like upwork.com and guru.com to get my first clients and build up a portfolio of work. You see, when you are first starting out, you need to have a track record to show clients that you know what you are doing. In the beginning, I did low paying work. But I did this because I just wanted to build a portfolio. After doing this for a few clients, I started to raise my prices. Each time I got a new client, I raised the price. I also started networking with local business owners in my city. I attended networking events, I also joined co-working space where I built relationships with other business owners. These relationships turned into paying clients and they also brought me in referrals. I did a really good job for a very affordable price. Some of my clients loved my work so much that they referred me to other people. These “word of mouth” referrals really helped me because people usually want to do business with people they can trust. When you do a good job and treat your clients well, they will refer you to others. Also, I made sure to ask my clients if they knew anyone else who needed help with their business. I started a blog on my social media consulting website and I blogged about topics that my ideal client was interested in. People started finding me through my blog posts and asked to work with me. I shared my blog posts on Twitter, LinkedIn and Facebook mainly at the beginning. (Now I share more of my blog posts on Pinterest). Each of these topics related to the services that I provide my clients. They also help to educate my target market which are mainly small business owners. When I first started out, I helped any type of small business. But as time went on, I noticed that certain types of businesses were getting referred to me. These became law firms and technology companies. Since I was helping legal service companies, they naturally started referring me to law firms and legal technology companies. I grew into serving a few specific niches and this really helped me work with higher paying clients. If you are just starting out, I don’t recommend that you chose a niche right away. Give it time and be open to working with different types of businesses. Over time you will learn which industries are more profitable and what types of business you enjoy helping. What allowed me to work a full-time job and also have a side business that I only worked 2 hours in was the fact that I outsourced. I hired a small team that included: a virtual assistant, freelance blog writers, a graphic designer and a website developer. It was a very small team but they helped me tremendously especially when I felt overwhelmed that I couldn’t do everything myself. I used Trello to manage our workload and communicate with my team about the status of tasks. This allowed me to focus on mainly selling and not doing the day-to-day implementation work. This is how I was able to work only 2 hours per week for the most part. Of course it didn’t start out like this. In the beginning I had to do the work myself. This allowed me to learn it and know what I was doing first before I handed I off to someone else. I also created some training documents and built systems that my team could follow so that I didn’t have to micro-manage them. Trello was a life saver and I created boards like this one to help us manage the work and even communicate with some of our clients. When you are a professional social media manager, you can use scheduling tools that let you save time. Instead of posting in real time each day, you can pre-schedule the content that goes out. Some tools that I have used include HooteSuite and Buffer to schedule social media posts. A social media management business is a great way to get your start working for yourself. I actually put together this getting started guide that shows you how to setup your own profitable social media management business. You can download it here. Download this FREE Guide on how to start a social media management business.